At a luncheon that was part reunion and part progress report, Pope Francis invited 21 Syrian refugees to join him at the Vatican on Aug. 11. The pope's lunch guests included the 12 refugees—three married couples and six children—Pope Francis brought back to Rome with him from Lesbos, Greece, in April and another nine Syrian refugees who arrived in Rome in mid-June with Vatican assistance. While the Vatican is covering the living costs of the 21 refugees, they are being housed and resettled by the Community of Sant'Egidio, a lay community based in Rome. The community runs a large Italian language school for refugees, which the Syrians are attending. Greg Burke, Vatican spokesman, said both the adults and the children had a chance to talk to Pope Francis about beginning their new lives in Italy. 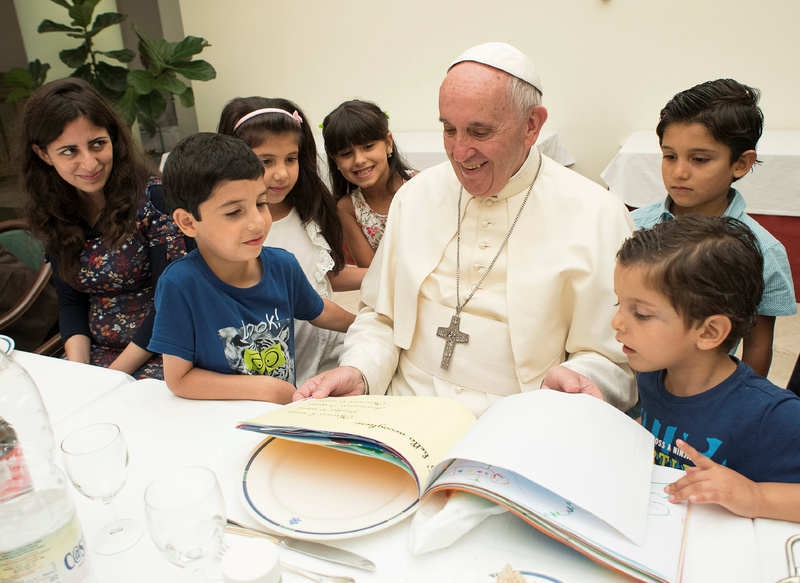 "The children gave the Holy Father a collection of their drawings, and the pope reciprocated with toys and other gifts." Joining Pope Francis and the refugees for the lunch in the Domus Sanctae Marthae, where the pope lives, were: Archbishop Angelo Becciu, a top official in the Vatican Secretariat of State; Andrea Riccardi, founder of the Community of Sant'Egidio, and other community members; Domenico Gianni and two other members of the Vatican police force, who assisted in getting the families from Lesbos to Italy. Members of the Sant'Egidio Community helped the Vatican interview refugees in Greece and choose families that both the Greek and Italian governments would provide with the necessary travel papers in time for the papal flight. Of the 21 refugees, one married couple is Christian, the others are Muslim.